One of today's most refreshing young creatives gives the inside scoop on how to make it as a graphic artist. From art school student to designer for Nike, Topshop, and Google, Kate Moross has lived the life that young graphic artists dream of. But it hasn't always been a smooth ride, and in this informative memoir and guide Moross offers true insider's tips on how to make it in a highly competitive field. Written in an approachable, forthright, and refreshingly honest tone, Make Your Own Luck features chapters on how to thrive in art school, developing your own style, how to self-promote, collaboration with other artists, how to deal with "copycats," and when to consider working for free. She also touches on the fine points of music packaging and videos, how to find an agent, and looks back on the touchstone moments that helped shape her career. Designed to mimic Moross's signature bold, brightly coloured style, this book is filled with dozens of examples of her work for companies such as Google, Adidas, and Nokia, as well as musicians including Simian Mobile Disco, Jessie Ware, Zomby, and Pictureplane. 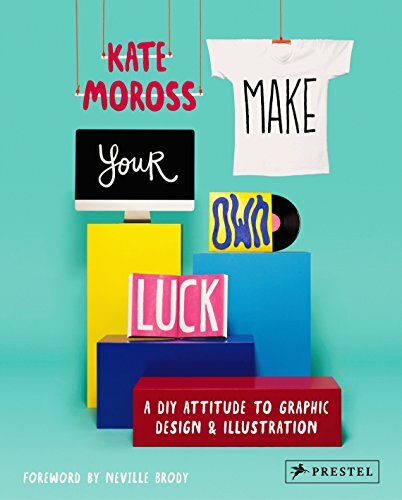 Irreverent and packed with enormously helpful tips for designers of all stripes, Make Your Own Luck is certain to become an indispensable guide for anyone interested in graphic art as a vocation or hobby.